The Dog or Cat Pet Caskets are available in Regular and Deluxe styles with a rich almond color, leather-grained textured exterior. These pet caskets are constructed of strong, high-impact styrene (a very hard plastic) with a double wall design for extra strength and durability. This design and the sealant included help to restrict seepage of water and the intrusion of air and can serve as a Casket-Vault combination. The Regular Interior consists of a pad and pillow with a rose-tan colored crepe-like material trimmed generously with a light tan lace. The pillow has an accented floral applique. The double walled caskets have a hinged lid. The Deluxe Interior consists of a pad and pillow as well as a padded casket lid trimmed with lace and the casket skirting as shown. A thin coverlet is available at an additional cost. 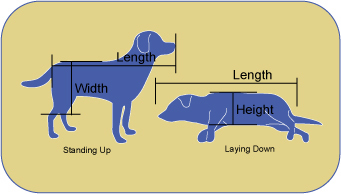 Please measure your pet as shown in the diagram to determine what size casket to order. You should allow two extra inches on the length so that the pet will fit comfortably in the casket. 32" x 16" x 11"
40" x 18" x 12"
Ships same business day if order is placed by 12pm EST. Please note that the weights listed are dimensional weights used to calculate air shipping costs and are not the actual weight of the casket. Please note that the dowel pictured, holding the casket open, is for display purposes only and is not available.